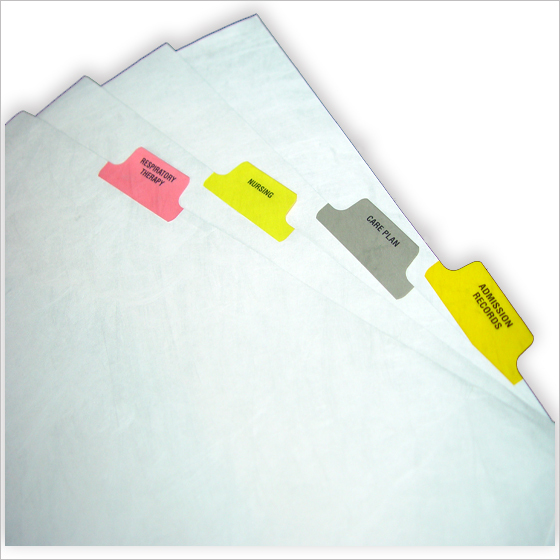 Home » Healthcare / Medical » Patient Charting Systems » Paper Chart Tab Dividers » Tyvek Chart Tab Divider Sets - Rip Proof! Long-Term Care Divider Sets (Designed specifically for use in Long-Term Care settings). Admission Records, MDS Assessment, Care Plan, History & PX, Physicians Orders, Progress Notes, Nurses Notes, Nurse Assts Notes, Medication & Treatment, Lab & Special Reports, Rehab & Therapy, Social Services, Activities, Dietary, Advance Directives, and Legal & Misc..
Hospital Divider Sets (Designed specifically for use in Hospital settings). Physicians Orders, Progress Notes, Graphic Chart, Nurses Notes, Medications, Laboratory Reports, X-Ray & EKG, Consents & Operations, Consults, History & PX, and Others. Home Care & Hospice Divider Sets (Designed specifically for Home Care agencies). Admission/Administration, Physicians Orders, Care Plan/Assessments, Nurses Notes, Home Care Aide Notes, Rehab & Therapy Notes, Social Services Notes, Medication/I.V.s, Lab, Special Reports, and Correspondence/Misc. Assisted Living Divider Sets (Designed specifically for use in Assisted Living settings). Pre-Screen, Admission, Medical History/Evaluations, Service Plan, Physicians Orders, Care Notes, Medication/Treatment Records, Lifestyle Preferences, Transfer/Referral/Discharge, Legal, and Emergency.